Couple days ago I had a big ol’ whopper of a zit, right on the tip of my nose and a number of social engagements that required peak cleanliness. What’s a girl to do? Unfortunately I’ve been in this situation more than once. It seems that if my face wants to break out, it saves it all up for that one, really noticeable spot. When I was in Singapore I was very interested in bringing home herbal medicines made in Asia. I picked up something called “Pimple Cure”. Made in India, this product contains two ingredients: Basil Oil and Cream Base. (The tube does not have the Latin name listed) I had heard of using Basil for skin conditions so I thought this product had credibility. I usually use something drying on my face because of its tendency to be oily, but this time I was willing to apply cream, maybe out of desperation? I didn’t even meditate. I just rubbed it in and hoped for the best. AND – in TWO DAYS it was gone – like it never happened. You know what this means? It’s Basil Time. I will work with the Basil cream as if it were Garden Basil, Ocimum basilicum, because I have also been using Holy Basil, Ocimum sanctum, when I am stressed. Then I can cover both species in the Materia Medica under the general term “Basil”. I tried Holy Basil, also known as Tulsi, in capsule form on a whim one day when I thought the Earth was crumbling around me. I felt so good afterwards that I continue to ask Tulsi for help (and a high dose of B vitamins). This was about 3 months ago. Now I use the tea from Organic India because I have so many samples of it. It’s not quite as effective because the dosage is much less in comparison to the capsule. But tea is so soothing, and I am calmed just by holding the hot cup in my hand. A friend recently told me it can bring you in either direction. Pump you up if you’re low energy; calm you down if you’re revved up. Isn’t it neat that in both cases with Basil I chose to use it with a quick decision? Is this Basil’s relationship with me or is it universal? Fast acting, the idea springs out of nowhere – and I go for it! – like there’s hope in the sweet smell. And then it works…the best sort of ending. What if Basil gave me “Get Out of Jail Free” cards and then I get used to it, or something of the sorts? -Development of Basil’s Materia Medica by reviewing what other Herbalists have to say, meditation and reviewing the growing habits/habitats I’ve seen. – Use Pimple Cure from India on any type of zit/pimple (is this a bad idea?) and see how effective it is. – Applications of Tulsi in various forms for stress. 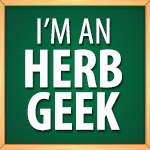 I will report back with my findings in two weeks, as any good herbal patient would. Allows such journeys to be made by body and soul! Janet from Lunaroma in Burlington, VT on the shop’s uses of Basil Oil – They currently carry cultivated Basil from Madagascar and wild-crafted Basil from India. Here is a link to the USDA National Agricultural Library where you can find the latest scientific research on the Ocimum basilicum species. Chevallier, Andrew. Natural Health Encyclopedia of Herbal Medicine, 2nd ed. New York: DK Publishing Inc., 2000. Duke, James A. The Green Pharmacy. Pennsylvania: Rodale Press, 1997. Gladstar, Rosemary. Rosemary Gladstar’s Family Herbal. Masschusetts: Storey Books, 2001. Greer, John M. Natural Magic. Minnesota: Llewellyn Publications, 2000. Hayes, Elizabeth S. Spices and Herbs. 1961 Ed. New York: Dover Publications, Inc., 1980. Kaminski, Patricia and Richard Katz. Flower Essence Repertory. 1994 Ed. California: Earth-Spirit, Inc., 1996. Kloss, Jethro. back to eden. 1939 Ed. California: Woodbridge Press Publishing Company, 1975. Pitchford, Paul. Healing with Whole Foods, 3rd Ed. California: North Atlantic Books, 2002. The Basil “Pimple Cure” cream has been spread cheek to cheek for several days. I put it on all the classic problem areas of my face, after washing. The most significant reaction I am getting is the reduction of swelling caused by such acne or pimple. If the skin is broken, it hasn’t necessarily sped up the healing time. The greatest use I am seeing for Pimple Cure is to subtract the amount of attention a pimple is causing, ie, bringing the bump back to an even skin level. Very useful! Though I may save it for those emergency situations only. The Tulsi tea was used for the first week. I was not noticing much… I went back to the capsules to take note of any differences. And there it was – that sweet sweet feeling of a clear-head. When I started using Tulsi I couldn’t pin-point exactly how it was making me feel different, I just felt ‘good’. After reading and meeting with the herb, I can easily see what is changing mentally. It’s like I have a fresh start, a new brain with no history of stressful worries. I can think in a clear white space and bring to my mental focus what I want to be there, instead of being bombarded with all the “what-ifs”. I feel motivated, not due to an increase of energy, but because I have the mind-capacity to do so. Very useful! And safe to use over long periods of time! I’ve studied multiple sources and their uses of Garden Basil. These can be found under Basil’s Materia Medica. I’ve also studied Tulsi and her Materia Medica is in the works. The meditations started off slow, as I suspected. However, both Garden Basil and Tulsi contact has been made! – When the weather warms, grow both of these fabulous plants and make medicine from them! In fact, I wouldn’t mind growing as many Basil varieties as I can get my hands on. So if you have any seeds, let me know and we can swap! I had never meditated with either Garden Basil or Tulsi before this experiment. That is partially why I chose them to work with; a challenge I could learn a lot from! 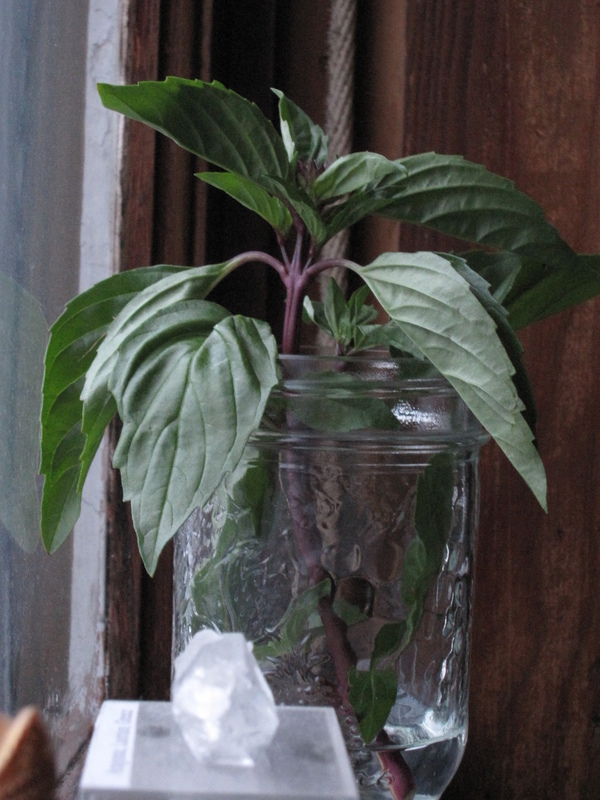 The other more obvious reason for a Basil Experiment was my current usage of two Ocimum products. I started trying to contact Basil three weeks ago. Reconnecting with my Guiding Spirit and my Inner Council. I felt a very dark energy in my apartment near the attic door, and was actually scared to be in such a vulnerable state of consciousness, so I stopped. I equated it to a possible ghost. I was whispered a phrase with no visuals – “You must have Basil in you for contact.” I started drinking Tulsi tea and rubbing the Basil cream on my face sporadically. The ‘dark energy’ was still present and could now be sensed when I wasn’t meditating. Basil atten-dance! 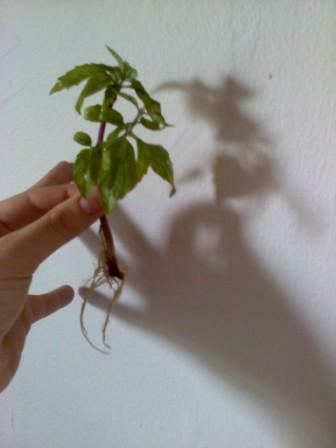 A young Basil with dark purple stem and bright little green leaves. This was a good sign. I had now heard and seen Basil. It meant the Spirit was willing to communicate and was going to do so in slow steps, probably making sure I was listening and that I truly respected Basil. I was going to try and have a conversation. 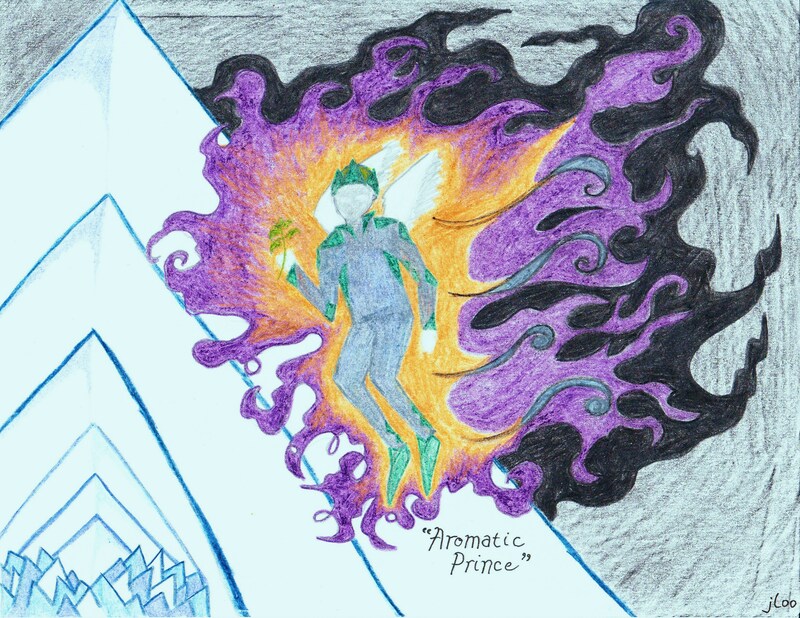 My Guiding Spirit who accompanies me on such journeys said something that made me full of joy, “Basil would like to speak to you.” Immediately after I felt the dark-attic-energy and became frightened. I thought maybe the dark energy was trying to trick me into letting it in to my body! (Now, I am still new at meditating with the Spirits in comparison to how much there is to journey through, so I try to be very careful with anything I don’t know) I told my Guiding Spirit I had to stop. I decided I should try meditating outside and see if the energy is still present, because, I guess, the dark energy could be Basil…? It was actually 4-year-old-me who prepared for the meeting. She adorned me with Guiding Herb, filled my body with sacred energy and rubbed my 3rd Eye open. Basil came as a fleet! The Basil Messenger came flying in, fit and quick. He brought messages from the powerful Father Basil, who lives as Garden Basil on Earth. The Messenger assured me Basil medicine was good for your skin, especially the face. And noted its ability to slice through any mental fog. The plant rots/wilts so easily that he too had to be quick, fluttering to-and-fro. It was hard to get a good look at his face, but that royal jumpsuit was no fooling. Like a jester meets doorman, Messenger Basil comes first. He is the Dark Energy. I asked about Tulsi and was informed that I must wait to speak with her, the Mother. I have to treat them separately in order to be respectful of their specific powers. The energy which spoke to me seemed calmer and possibly older, or at least more Motherly. Powerful and full of white light, Tulsi beckons me to wait. A promise of future love. Then there was Thai. Oh the sweetest daughter of two powerful forces, Thai Basil likes me and promises good things from her medicine. She has Garden Basil’s darkness and the light beautiful flowers of Tulsi, which she gently caressed my face and nose with. She appreciates my travels to her land and the love I show Thai’s in America. For this she is grateful and wants to be friends. A darling herb, I am blessed with such sweet fortune. The meditation is absolutely splendid, and not scary in the least! Messenger tells me that my body subconsciously had called to Basil, and is the reason this experiment exists! So before I tried to reach them spiritually they had heard my body call. And Thai Basil Spirit answered, bringing forth Messenger to my meditation. I find myself too scared to meditate at night alone. So I lay next to my partner, feeling safe. Guiding Spirit is called to and catches me up on some self-improvement. My mind is racing with anticipation and I can’t find a way to meet up with Basil. I barely know them! So I ask a good friend, Queen Anne’s Lace, to play. She is a dear Plant Ally who I am utterly in love with. Such a good friend. She shares her ideas on self-improvement and we dance for quite some time until I remember that I had been looking for Basil. “Like Yarrow, a male Spirit I know, but that’s a lot to ask one plant. Maybe Mullein will help, a male Spirit I know by association.” So I find two and wonder if I need another. And in comes Basil Messenger, flying about Yarrow and Mullein. He is speaking and acting quickly. Into my head he flies! Gobbling it up like a blender. I’m scared, but the energy seems good so I let it continue. Then a black temptress version of Thai Basil follows Messenger through each space of my body, filling it with dark whirlwind energy. I actually begin to worry, my heart is racing and I call to any herbs to help! I begin thinking of any pretty female Spirits I know to combat the darkness. I am being stung by scorpions and told to feel the dark energy, just let it be. Anyone?! Help! Then riding in on butterfly wings comes Tulsi. A wave of white, flowing energy, she blows wind over my body and a white comfort covers me. She is smiling, laughing, and loving along with Father Basil, who begins to grow at exponential proportions. He has come forth, creating large pyramids showing his rock hard power and strength. The two combine male and female aspects to be Krishna; a wonder of the two genders, admired and respected by all. It is my partner’s balancing male energy that has allowed me to contact the Basil family. It’s their way of showing that Basil Spirit can be male and/or female form. The Basil aroma unites their family. Tulsi keeps Garden Basil light by giving him delicate white flowers. She balances his dark edges. 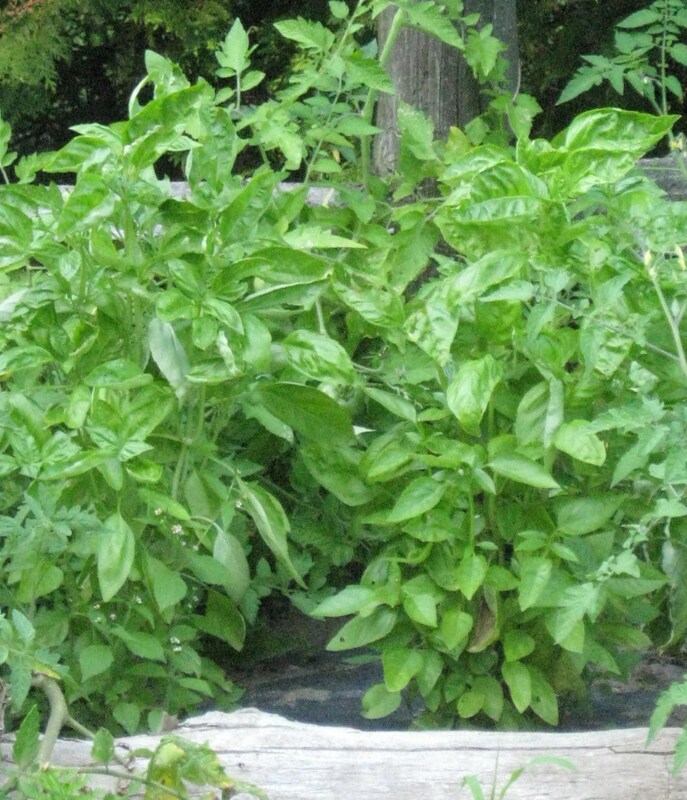 Garden Basil is the quick moving power, masculine and scorpion. Tulsi is nurturing like a Mother, light and airy. Thai Basil, their daughter, receives attributes from both. Her dark purple stem holding up her light purple flowers. I see Garden Basil and Tulsi royally as they bid me adieu. He has white hair and dark clothing, she with dark hair and white clothing. They appear to be celebrities, honorable and magnificent in their grandeur. Father Basil is kissing me happy for the Materia Medica I posted. Tulsi gives me her blessings that she will return. Thai Basil, who appears to me as her plant-form, invites me back for more at any time. And they all encourage me to continue. I thank Tulsi and the Basil Family for allowing me to share this information with you. How I’ve been feeling – up to feb 3: Feel uplifted, a little more positive about myself and my situation. Very motivating to have a project. Then starting saturday I felt moody and irritable. Refusing to help myself by blaming others, then… basil idea! Drank lemon ginger Tulsi on Sunday. Ginger too strong, let steep too long? Drank regular Tulsi once last week but didn’t notice immediate effects. Have not used Basil cream bc no serious acne. Put on red nose-dot tonight (those ever lasting blood vessel dots that appear out of nowhere and never go away…) and small meditation/mantra/words spoken and asked for help. Feb 9: Switched to Tulsi capsules two days ago. Taking two capsules once a day. The tea was not doing it? Used the cream one morning and the pimple’s swelling went down but no immediate reactions or clearing. Today the acne is about 50% gone. Works well actually. No weird side effects like irritation. Would use after the experiment, but maybe not before pimples are apparent. I guess my head feels better. I feel clear. Not really super-motivated, but definitely not as sad/moody. Balanced and ready but not over-hyper. Calmer. Feb 15: Stopped taking capsules for some weird reason and can feel head racing, at night especially. Lost the lesson so quickly from Basil… must be long-term with Tulsi. Face was clearing and then moon moment brought a full on break-out. I held off on basil to let my face do its thing (its once a month, and can be solved through the liver). Thai basil came from Vietnamese restaurant. Looks happy, waiting for roots! Not interested in summoning the rumored and mysterious Basil Scorpion, but am keeping in the back of my head the idea that you should not use Garden Basil for too long of a time, especially the essential oil. Am itching to de-dread, A clear head. Feb 18: Feel like crap. Have headache after sore throat and runny nose (brief). Head is foggy behind nose and above throat, very strange. Allergies? I keep thinking it might be. Am trying combos of many different remedies. Taking Tulsi to clear my head as supportive therapy during cold. See Basil darkness as little side-kick animal. Interesting. Face clear except a few, and some with scabs from popping. Haven’t been applying cream. Cleanse the liver! March 3: head aches not apparent. Can feel fog in brain though, if I really concentrate on it. Mind racing at night, but its an exciting time of year! So I read. Wanting to meditate again, haven’t since the big meeting, actually tired me out in a different way than say, farming or studying. My Journey Spirit was tired. But I am looking forward to meeting with the Basil Family, and seeing what they have to say about continuing with the herbs. March 11: Meditated last night. Keep Tulsi but in smaller doses. 1 capsule mid-afternoon. March 27: Still frolic with Thai Basil. Came to me in meditation for the window planting. Haven’t taken Tulsi in a while, but when I do I am going to try her with the B vitamins again. The dark energy near the attic has faded. I like Thai Basil. She is calm. Have felt clear-headed and positive, so neither Garden Basil nor Tulsi have been beckoned. However, I was thinking of Tulsi recently in a daydream. I am excited to have such great friends to summon when in need! Thank you Basil Family! Blessed Be! 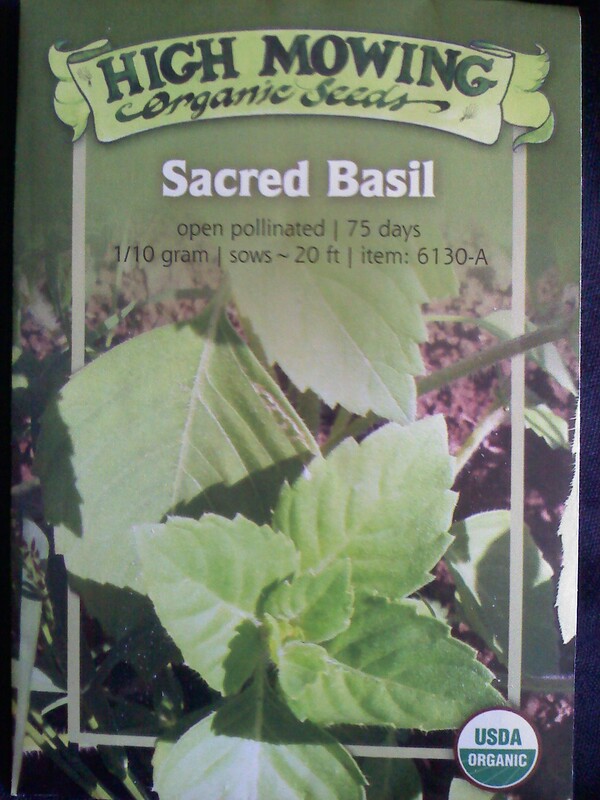 Seeds I bought at Gardener’s Supply from High Mowing Seeds in Wolcott, VT. I am not sure if it’s Rama Tulsi or Krishna Tulsi, but the High Mowing website had this to say: “The Hindu people of India worship this plant as “Tulasi”, the incarnation of the goddess.” I have added their website to the sidebar under Products From Experiments. Darling beads of life. And there she is, bright-eyed and bushy-tailed. Amongst many sisters in a tiny windowbox (seems to be my trend). Switched to Tulsi Dietary Supplement from Organic India. Ocimum sanctum (2 varieties) and Ocimum gratissimum. Recommended Use: 2-3 capsules morning and early afternoon. 100mg of each herb per capsule. 1.2 – 1.8g per day. I have personally sown and grown O. tenuiflorum and gave it the name Bubblegum Bush, because its fragrance reminds me of such. In observation, this variety holds on tight and will grow even if neglected (of course she does not prefer this and will do much better with lots of love and attention). This summer I grew the O. sanctum pictured above and observed her growing preferences as similar to the tenuiflorum. Seed, Flower, Leaf, Stem, Root ~ all parts! If you want to get creative, there are dozens of recipes from India and S.E. Asia which include this Sacred Medicine. Taryn Forrelli, N.D. (Naturopathic Doctor) shares her thoughts. Holy Basil can be very helpful in relieving stress. If not taken care of, stress can increase illness. Your body becomes weakened by the illness, and yet, continuing stress in your life can take away the energy your body needs to heal. Thus creating a dramatic downfall into stress-induced disease. But Holy Basil can help to stop this from happening by leveling with your mind and body. The Holy Herb can help you create a “positive stress response” and prevent further damage from daily stress (Forrelli 1). Horizon Herb’s website offers more insight on growing Tulsi. Here’s a link to the USDA National Agricultural Library, also known as AGRICOLA. 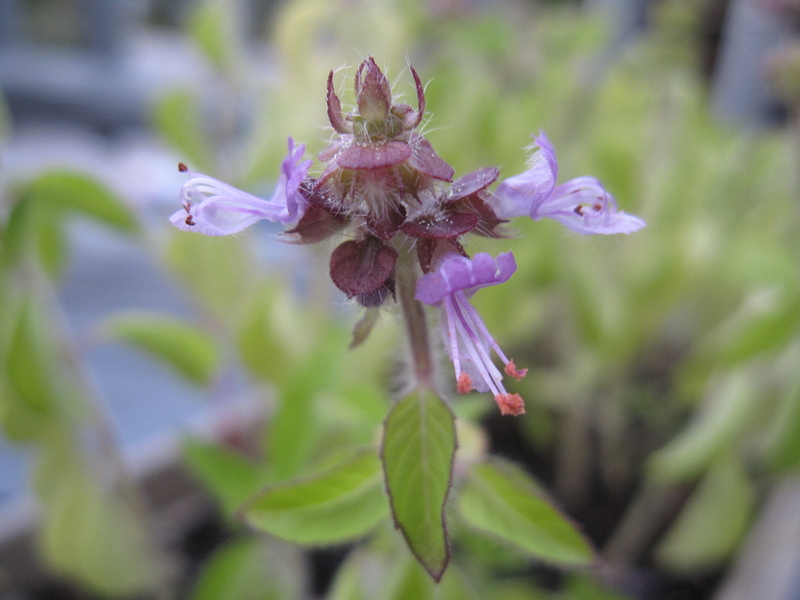 You can search any of the Holy Basil species and read about their recent scientific findings. Cech, Richo. Making Plant Medicine. Oregon: Horizon Herbs, 2000. Forrelli, Taryn ND. Natural Stress Relief: Supercritical Holy Basil. Vermont: New Chapter, Inc., 2010. Frawley, Dr David and Dr Vasant Lad. The Yoga of Herbs: An Ayurvedic Guide to Herbal Medicine, 2cnd ed. Wisconsin: Lotus Press, 2001. Smith, Ed. Therapeutic Herb Manual: A Guide to the Safe and Effective Use of Liquid Herbal Extracts. Oregon: Ed Smith, 2006. Hi,I got tulsi cuttings from my Indian friend and I have been putting it in water, changing the water every day and so far 2 1/2 weeks and no roots. What am I doing wrong? Hello Krynauw, I believe it is still possible to get roots from your cutting. It may take another week or so. Maybe change the water once every 3 days to cause less disturbance/shock to the plant. I never changed the water with my Thai Basil, just added more water if it became low. If the bottom of the stem has turned brown or rotted, snip it off to start fresh. Goodluck!